Thanasimus dubius (F.) (figs. 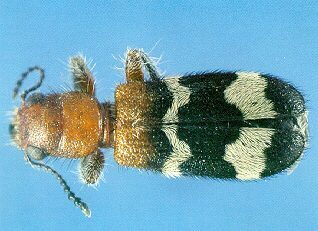 14, 15, 16): The checkered beetle, T. dubius (7.5-9.0 mm), has easily distinguishable black elytra with white angulate crossbars. The head, thorax, and base of the elytra are red. The larvae are pink when alive (white if preserved), do not have fused thoracic shields, but are otherwise similar to T. virescens larvae (see fig. 10).